Congress passed the Dead Indian Land Act in 1902. The act allowed Indians to sell allotments inherited from deceased family members, but the act was ultimately used for fraud against the tribes, and the interests of the Indians were never protected. The Burke Act of 1906 was passed to declare that Indians could be considered competent for the sale of their lands, but this was also used to cheat Indians. More than 60 percent of the Indian allotments were owned by non-Indians by 1928. Those Indians who were born after the allotments of 1892 had no land of their own by the 1920s. Another round of illnesses, particularly tuberculosis, struck the Arapaho in the early 20th century. 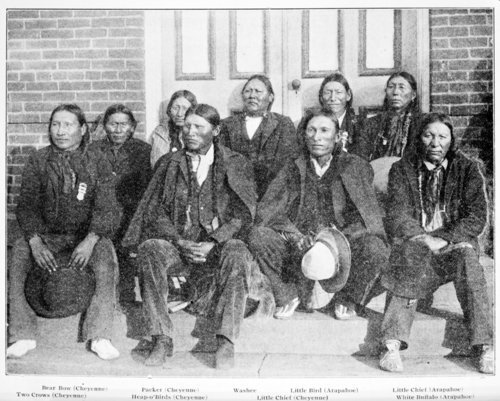 There were nearly 981 Southern Arapaho in 1900, but only 820 were alive in 1929. The Oklahoma Indian Welfare Act was passed in 1937. The act ensured that the remainder of Indian-owned lands would stay in trust status indefinitely, but by this time the vast majority of the allotments had already been repossessed, illegally taken, or sold through treaty from the tribe. Economic problems and the onset of World War II caused a large number of Southern Arapaho to move to urban areas to find some form of employment. The events of the early 20th century left the Southern Arapaho without a strong geographically concentrated population. The Southern Arapaho joined with the Northern Arapaho to maintain traditional ceremonies. Government and public attitudes toward Native Americans changed during the 1960s. Under Presidents John F. Kennedy’s and Lyndon B. Johnson’s administrations, the government started to fund more social programs. Such programs included housing, increased educational opportunities, civil rights support, and economic development. These social programs benefited the Arapaho. The United States shifted its policies toward giving the tribes more autonomy and control over government funds for the tribe in the 1970s. Tribes, including the Arapaho, were given the means to establish a contract with the government to manage programs that had previously been under federal officials by the Indian Self-Determination and Education Assistance Act of 1975. Many government jobs were terminated and medical as well as other services to those who struggled economically were drastically reduced under President Ronald Reagan’s administration in the 1980s. The Reagan administration’s economic policies had a goal of benefit through across-the-board budget cuts. In the short term these cuts hit the economically disadvantaged hard. Groups like the Southern Arapaho were particularly vulnerable to such a shift. The declining oil prices also hit the local economies of Oklahoma and the Wind River Northern Arapaho Reservation in Wyoming. Unemployment among the Southern Arapaho was estimated to be as high as 40 to 70 percent in the 1980s. Compared to the national unemployment rate of 5 to 15 percent, the Southern Arapaho were facing a severe crisis. Most of the Southern Arapaho were no longer living on lands that were a part of allotment in the 1890s. They had a hard time finding jobs while living in non-Indian communities. They had to face both a lack of available work as well as discriminatory hiring. Although the Northern and Southern Arapaho try to stay in contact with each other and share a culture, life for each is a different experience. There were an estimated 4,000 Northern Arapaho in 1989. Most were still living on the Wind River Reservation with limited intrusions or interference by non-Indians. Federally funded housing projects allowed the tribe to update homes on the allotments, many of which did not have plumbing or electricity in the 1960s. The reservation remained large in area and stayed under tribal control. Northern Arapaho children were still living in extended families. A more communal culture than that of the rest of the United States endured among the tribe. At the social-cultural center of the tribe are the elders who play a vital role in raising their grandchildren and promoting traditional Arapaho values. The public schools on the reservation teach Arapaho culture and language. Two high schools were opened on the Wind River Reservation in the 1970s to promote tribal values through secondary education. Although the Northern Arapaho faced fewer obstacles than the Southern Arapaho, they still faced challenges. Unemployment rates, even during the peak of the social programs in the 1960s, were as high as 40 percent on the reservation. The situation only became more difficult for the tribe when the cuts were made to federal programs under the Reagan administration. The communal culture of the tribe helped during periods of economic stress. Tribal income from gas and oil, as well as the use of tribal lands, was distributed with 85 percent going to individuals and 15 percent to the business council. The tribe was bringing in close to 4.5 million dollars of income annually during the 1970s. The Arapaho managed to resist economic challenges, discrimination, and attempts to destroy their culture to pass their culture on the current generations and develop economic growth through education. The Northern Arapaho General Council formed Sky People Higher Education in 1979 to meet the higher education needs of the tribe. One of the ultimate goals of Sky People Higher Education is the promotion of the Northern Arapaho tribe’s sovereignty through creating opportunities for higher learning. The tribe has also worked to develop economic opportunities. The Northern Arapaho Tribal Industries, which is an enterprise owned entirely by the tribe, specializes in healthcare and information technology. The Arapaho Ranch raises grass-fed and hormone-free cattle. The Arapaho Ranch has a mission of adhering to a set of environmental ethics in the cattle industry, while providing job opportunities to tribal members. The Arapaho tribe’s industries are set to help the tribe maintain a competitive economic base to support the tribe and allow for the survival of Arapaho culture into the 21st century.